O’Shea-Hoey Funeral Home Inc. Provider of cremations, burials and traditional funerals – since 1927. Owned and operated by the Hoey family, for the last 40 years, John Hoey, manager and owner, is a 2nd generation funeral director. We are conveniently located in Astoria, New York – minutes by car and train from Manhattan and all other counties of New York City, NY. Our funeral home is located close to all NYC hospitals, nursing homes, and very close to all major airports. We serve all of the metro NY area. We are a family owned and operated funeral home. For prompt service please call us at 718-728-3131. We sympathize with families who can’t afford high cost cremation and other funeral services. There is no need to spend an enormous amount of money to cremate, bury or have a traditional funeral for your loved ones. We have an established tradition of helping families create a ceremony that is an important part of the healing process. We are an independently owned and operated funeral home that is uniquely qualified to help you and those you care about arrange personalized, meaningful, and affordable funerals or memorial ceremonies, whatever your traditions and preferences may be. We provide personal service for the community. 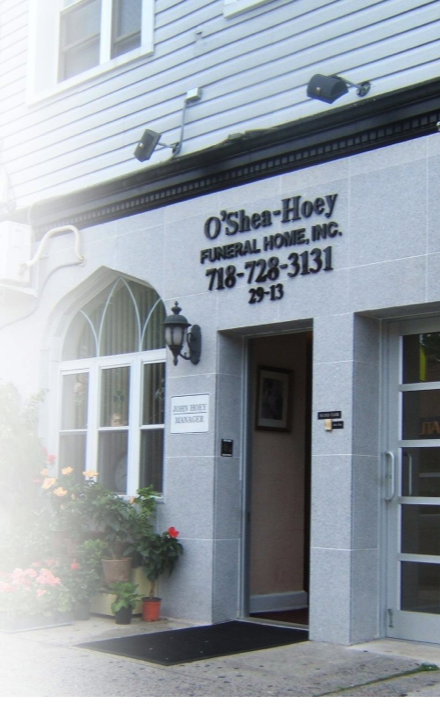 O’Shea-Hoey Funeral Home is not a large conglomerate, that handles thousands of funerals a year, where you spend a lot of money for a funeral that turns out to be impersonal. We provide the same service and the same funeral for a fraction of the cost, with a personal touch that you, your family and loved ones deserve. We provide all services at our funeral home. We are not just a cremation service or some new internet website business. We are experienced funeral directors, who are here to help you plan a dignified funeral. Thank you for visiting and please feel free to call us: 24 hours a day, 7 days a week with any questions.